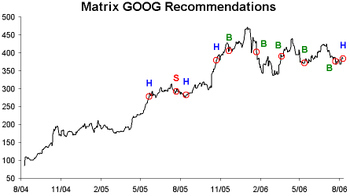 Matrix downgraded Google (GOOG) from a Buy to a Hold this morning. Below are their historical calls on the stock. While Matrix is ranked at the top for their stock calls based on BARR rankings, their calls on GOOG have been less than stellar.